Aaron Wines is another of those local wineries that we have not visited but have had a wine or two of theirs through friends. We decided to go in and see our friend T (Tajin) and take a trip through the tasting menu. The tasting room is in Tin City next to Benom Wines, Desparada, and Wine Shine. Not a bad little cluster of adult beverage makers. 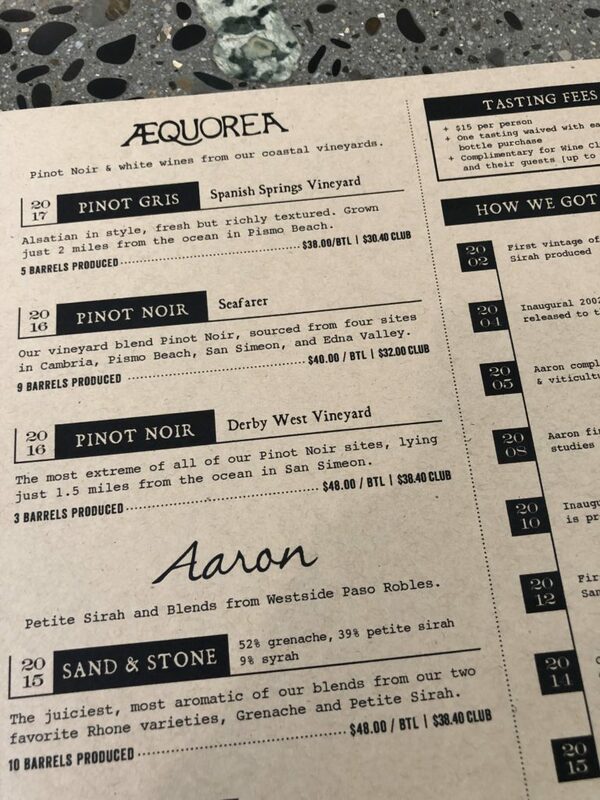 There are two labels to taste, Aequorea and Aaron. Side note on these, the label for Aequorea is beautiful. See photos below. I’m not going to lie (because what’s the point? ), I really enjoyed this tasting. The wines are beautiful. On this visit we grabbed the Aequorea Pinot Gris and the Aequorea Pinot Noir (Seafarer)…but we will be back to grab more at some point. A big thank you to our buddy, T, for taking care of us and giving us the lowdown on Aaron Wines. We had a great time!